Reward your Dog with a tasty soft chew that promotes a happy, healthy life. 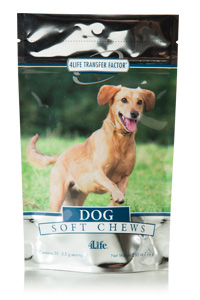 4Life Transfer Factor Dog Soft Chews provides a daily serving of Transfer Factor E-XF™ plus nutrients to support overall wellness. For use with Dogs only. Keep out of reach of children and other animals.